JCB has introduced a new lineup of skid-steer and compact track loaders (CTL) that prioritize visibility with a modified boom design. JCB has mounted its power boom loading arm 2 inches lower than on previous models, resulting in an improved view across the boom to the operator’s right-hand side, the company says. In addition to offering better visibility, the new power boom is also stronger and more durable thanks to new double tapered pins in the boom mounting tower and in the quick hitch. JCB used hard pipe hosing on the inner side of the boom for further protection. The boom also does a better job of protecting the quick hitch from wear caused by frequent attachment changes through a bolt-on wear plate. The diameter of the boom’s tilt cylinder has been increased, boosting bucket tear out by 10% on the new 250 and 270 models. JCB has also moved the tilt cylinder into the end of the boom. This change allows the cab to be raised for maintenance with the boom in any position. To ease entry and exit into and out of the machines, JCB has increased the door opening angle by 15% to 55 degrees, repositioned the grab handle to make it easier to reach from the seat, and bolted on a new external grab handle. The new loaders also boast improved air conditioning and updated heater vents. The new “Hi-Viz” large platform compact loader lineup includes four skid steers and three CTLs. 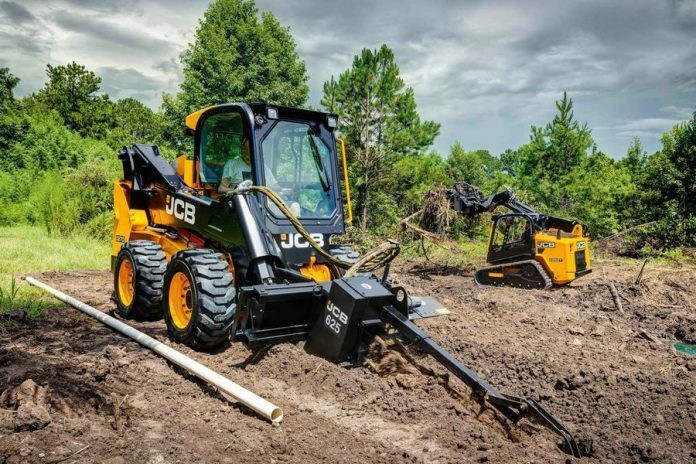 The skid steer models include; 250 (formerly the 225), 270 (formerly the 260), 300, 330 where else the CTL models entails; 250T (formerly the 225T), 270T (formerly the 260T), 300T, 330T.